Observation - Sea Wash Ball - UK and Ireland. Description: A two-hand sized ball of eggs found on a relatively sheltered rocky shore close to Instow (nr Bideford). Yellow-white colour, opaque. From the common whelk. 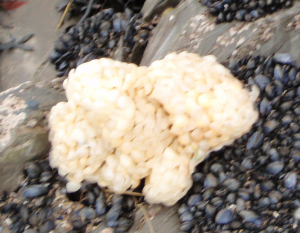 A two-hand sized ball of eggs found on a relatively sheltered rocky shore close to Instow (nr Bideford). Yellow-white colour, opaque. From the common whelk.